The Pound continued to rally during yesterday’s session after PM May’s announcement of another parliamentary vote on Brexit. Investors are confident that this makes a no-deal scenario even more unlikely, which has resulted in sharp gains for the Sterling. In economic news, Gross Mortgage Approvals came in better than expected, but the U.S. data was mixed. Factory orders were up 0.1%, far below the forecast of 1.5%. Pending Home Sales increased by 4.6%, its highest gain in two years. No relevant data coming out from the UK today. All eyes will be on the US GDP numbers. 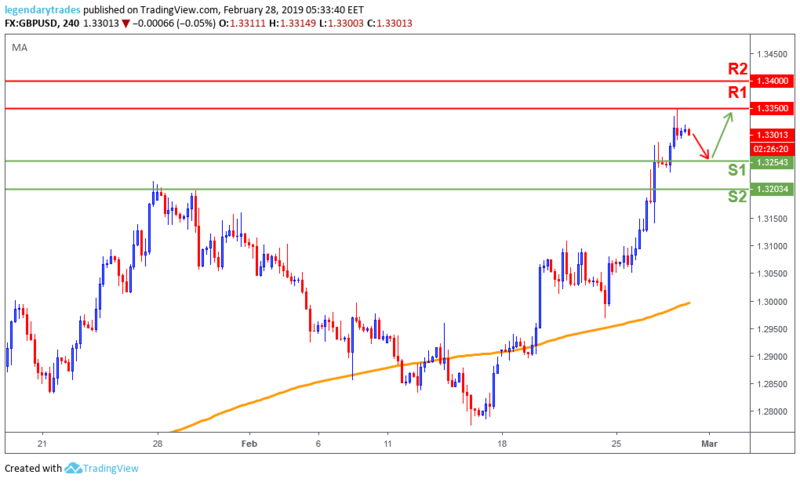 The Pound’s bullish momentum took a pause at 1.3350 (R1) and currently price is looking for a pullback towards 1.3250 (S1) / 1.32 (S2) before continuing its bullish trend. A break above 1.3350 (R1), will open the doors for a possible test of 1.34 (R2) resistance level.